Schmidt (Jonah Hill) and Jenko (Channing Tatum) are an unlikely and underachieving pair of rookie cops. When Deputy Chief Hardy (the brilliant Nick Offerman) decides to get rid… reassign them, the friends find themselves in 21 Jump Street. Here, they are tasked with bringing down a high school synthetic drug ring. However, on their return to high school they find that the rules have changed - and both are in way over their heads. Click Here To Join The 500 Days Of Film Club! I don’t really have a movie type or film genre that I prefer. I'm as happy to watch a drama as I am a documentary. However, if pushed to choose a genre, buddy action comedies not be it. So, I had signficiant reservations, when starting to watch 21 Jump Street. Relax, I told myself. This film actually has some good reviews - plus Channing Tatum. It can't be all that bad - can it? At the end of 21 Jump Street, I was surprised to find that I had actually really enjoyed this movie. It is funny (easily passing the six laugh test), ridiculously silly (which I am quite partial too) and pretty darn sweet (if you can get over all of the male organ gags). When 21 Jump Street was released (back in 2012), Channing Tatum’s comedic portrayal of Jenko caught many people off guard. At the time, Tatum had been written off as a handsome face and not much else was expected. However, it is his performance and Jenko’s endearing relationship with Jonah Hill’s Schmidt that lifts this movie above most immature/gross out action comedies. In addition, even when I started to tire of all the silliness, this film still made me laugh. The script (part written by Hill) delivers punchline after punchline. So, if you are in the mood for some outrageous, irreverent nonsense, I would recommend watching 21 Jump Street. 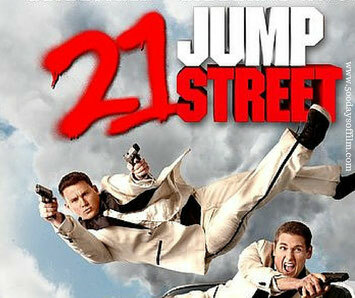 21 Jump Street was well received by audiences and critics alike. As a result, in 2015 the sequel - 22 Jump Street - was released and more are likely (including a 21 Jump Street Men In Black crossover... hmmm). Have you seen 21 Jump Street? If you have, what did you think of this movie? Do let me know by leaving a comment in the box below!